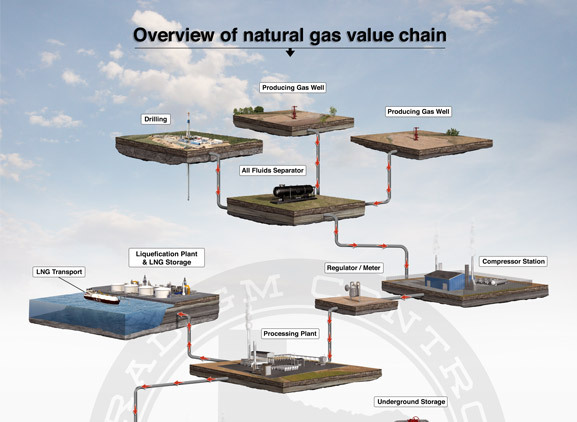 The Natural Gas Value Chain illustration depicts the life cycle of a natural gas well from drilling to end user. The process involves drilling and then producing the gas in the well if reserves are large enough to warrant commercial production. The produced natural gas is commonly held in inventory underground under pressure in three types of facilities. 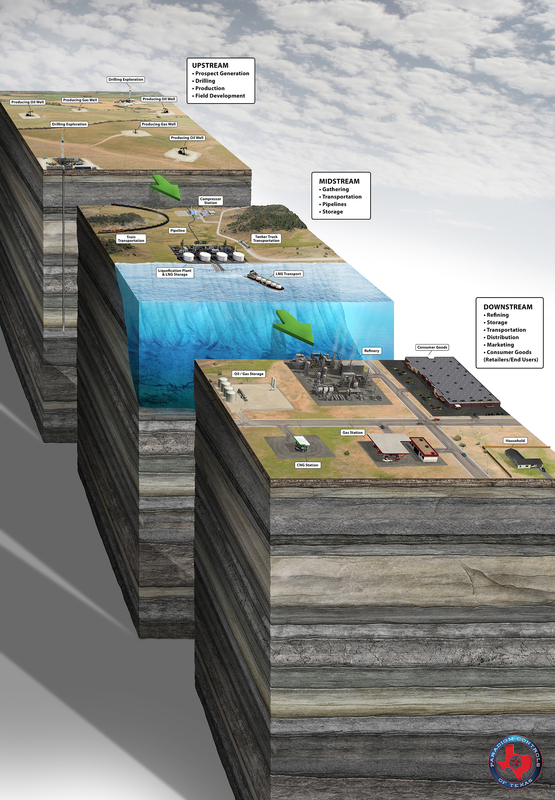 These underground facilities are depleted reservoirs in oil and/or natural gas fields, aquifers, and salt cavern formations. Natural gas can also be stored in a liquid or gaseous form in above–ground tanks. It is sometimes converted to Liquefied Natural Gas which is cooled to approximately -260 degrees Fahrenheit for shipment and/or storage. It is loaded onto large specialized LNG ships for importing and exporting. Because of its clean burning nature, natural gas has become a very popular fuel for electricity generation. New technology has allowed natural gas become the fuel of choice for new power plants built since the 1990s. CNG (compressed natural gas) can be used as a fuel source. There are two types of CNG infrastructure. Fast-fill stations are for retail situations where vehicles arrive randomly and need to fill up quickly. Time-fill stations are used primarily by fleets and work best for vehicles with large tanks that refuel at a central location every night. Large commercial and industrial consumers purchase natural gas for manufacturing and as a heat source, to make fertilizer, antifreeze, plastics, pharmaceuticals and fabrics. It is also used to manufacture a wide range of chemicals. Over one-half of the homes in the United States are supplied with natural gas. Most of the natural gas consumed in homes is used for space heating and water heating. It is also used in stoves, ovens, clothes dryers, lighting fixtures and other appliances. The upstream sector of the oil and gas industry involves the exploration and production (E&P) of crude oil and natural gas. Operations include determining where to drill, how deep to drill, and the design and construction of the well site. The well must be operated and managed to deliver the best return on investment while maintaining safety and leaving the smallest footprint. The right to drill involves leasing the acreage from the land or mineral owners and conducting the necessary reviews and interpretations of geological and geophysical data. Drilling the well is done by rig contractors who create the “borehole” in the ground. The rig contractor is supported by several oilfield service companies that all perform necessary functions to successfully drill and complete the well. 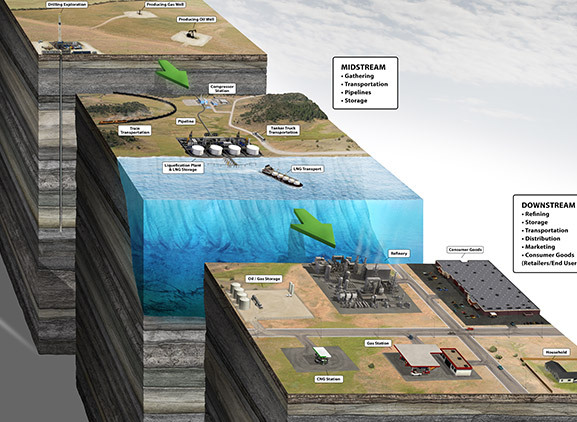 Producing the well includes recovering oil and/or gas using primary, secondary and tertiary oil recovery methods to maximize the oil and/or natural gas produced from the well. Once the well reaches the end of its productive life, it will be plugged and abandoned. This can be anywhere from a few years after the well is drilled to decades later. The midstream oil and gas sector involves activities that occur between the upstream and downstream sectors of the oil and gas industry. These include processing, storage and transportation of crude oil and natural gas. Because oil and gas reserves are not located in the same geographic location as refining and consumption regions, it must be transported. This is done by pipeline, rail, barge, oil tanker or truck. 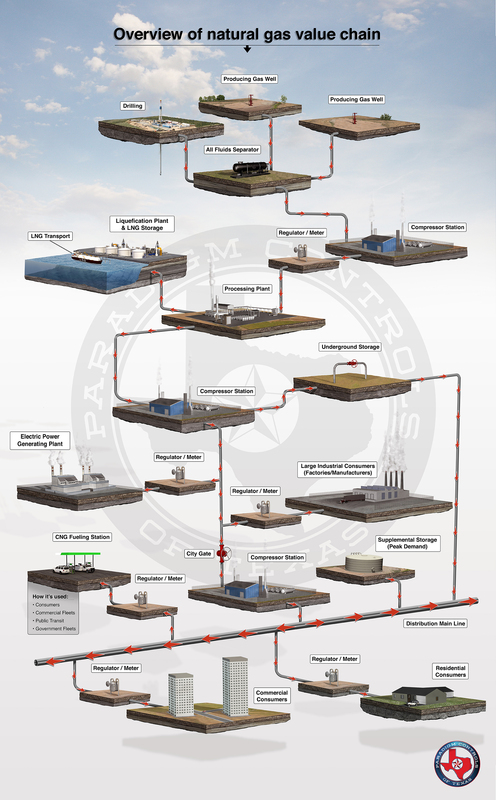 The midstream segment is considered to be a low risk, regulated part of the industry. The downstream sector involves crude oil refining, raw gas processing and the distribution and sales of these refined products to the end user. The downstream sector reaches consumers through sales of fuel products such as gasoline, diesel, jet fuel, heating oil, natural gas and liquefied petroleum gas (LPG). There are also thousands of products made from oil and gas petrochemicals that most people use on an everyday basis. Some other products most are not as familiar with are lubricants, synthetic rubbers, plastics, fertilizers and pesticides.